The western European engineering thermoplastics scene was a mixed bag in August 2012, according to the latest Plastic Information Europe (PIE) report. Commodity-related ABS and PP compounds responded to the feedstock hikes, which saw styrene add 135 euro per ton (/t) and propylene 120 euro/t, with increases of 90 euro/t and 80euro/t respectively, while PMMA customers without quarterly agreements were brought up to par with the price increase that had already been pushed through in July’s quarterly negotiations. Despite the 108 euro/t increase in the price of benzene to a new record high, the protective quarterly agreements for PC, PA, POM and PBT acted as a shield and ensured a rollover. Supply was mostly well balanced with a slight tendency towards a surplus, says PIE. Producers responded to the slack holiday sales by implementing production cutbacks or launching maintenance turnarounds earlier than intended. Nevertheless, most deliveries of standard material were executed promptly. A number of players told PIE they were clearly feeling the effects of the summer lull, as orders from the mass car segment were few and far between, especially in southern Europe and France. Further rises in feedstock prices pushed up September’s contract notations for styrene and propylene by 43 euro/t and 105 euro/t respectively. As a result, heated discussions with customers about upcoming price hikes for ABS and PP compounds are therefore inevitable. With PA, too, statements from major manufacturers about impending price rises are making converters nervous, especially in view of the imminent fourth quarter negotiations. PIE says many players are already pinning their hopes on the new Volkswagen Golf 7, although it may well take a little longer to get going than originally thought. 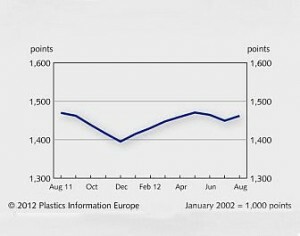 Nevertheless, the new model could well have an influence on the September price rounds for engineering plastics.